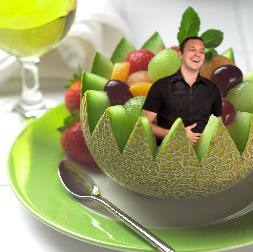 Alas, Men Laughing with Fruit Salad. We hardly knew ye. "And one thing I've found, is that every good road trip needs a good inside joke that only the people who went on the road trip will get. And your friends who didn't go on the road trip will want to... kill your legs... every time you bring it up." — Strong Bad, Strong Bad Email #156, "Road Trip"
There are some jokes almost anyone can get, and then there are ones that can only be understood by people with certain knowledge. Jokes about computer programming that can only be understood by technicians, jokes about a film that only make sense if you listened to the director's commentary, jokes about a country's political system or culture that only citizens of that place could ever laugh at. If you are in on the joke, these can be hilarious; if you aren't, then they get irritating fast. From a sociological point of view, in-jokes are used by groups to identify those who are Not Us — anyone who's not a member of the group is not likely to get the joke. If these are frequently placed in a show or book, then it can become a case of Viewers Are Geniuses, or if they are language related, Bilingual Bonus. Fandoms are often teeming with them, so seeing a certain one everywhere may be a result of Fan Myopia. In some cases, may even lead to Memetic Mutation. If the group is big enough, or is generally a Fountain of Memes, it is easily confused with Memetic Mutation, and often is on this very wiki. However, as long as the particular in-joke stays confined to the group itself it is not an entire internet meme, although attempts may be made to force it from time to time, some successful. If the creator acknowledges the joke or meme in the work itself, it becomes a Fandom Nod or an Ascended Meme. Compare with Noodle Incident. An Outside Joke relies on an opposite effect. Not to be confused with the webcomic The In Joke.